This week another small part of our archaeological heritage was discovered in Ballylongford County Kerry when a couple found a bronze brooch in the ashes in their solid fuel cooker. The ashes were from some turf from a nearlybog. 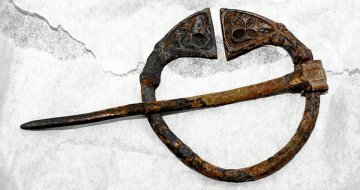 Archaeologists believe the brooch would have been fastened to the cloak of a clergyman and was probably dropped on a forest road in north Kerry which eventually became bog land. The brooch is embossed with a cross and dates to the early Christian times in Kerry some 1,400 years ago. The brooch will go on display in Kerry County Museum in a few months time. Fortunate find! Enjoyed the post.